The first exhibit of work by members of the Nature Artists’ Guild of The Morton Arboretum next year will take place at the Downers Grove Public Library from January 2 until February 2, 2019. Current members of the Guild will need to return their completed prospectuses (e-mailed to members on November 17, 2018) by Monday, December 17, 2018 to be eligible to participate. This one is easy! Since the artwork must have been included in a Nature Artists’ Guild exhibition within the past five years, it is already completed, titled, framed, and ready to hang, and just needs to be dropped off at the library on Saturday, December 29, 2018 between 10 and 11 am. All details are in the prospectus. The Downers Grove Public Library has a long and interesting history as well as an impressive collection of original artwork. The Nature Artists’ Guild is excited and proud to once again begin the new year as the first participant in their rotating exhibit, Active in the Galleries. Many of the artists participating in the upcoming exhibit, The Promise of an Acorn, at the Brushwood Center at Ryerson Woods in Riverwoods, IL are also members of the Nature Artists’ Guild of The Morton Arboretum. The artists would like to extend an invitation to all nature and art lovers to the opening reception and exhibit. Please click on the above highlighted link or on the image for directions and more information. Our exhibition, The Promise of an Acorn, focuses not just on the oak itself, but also on the unique habitat it creates, the other species it supports, and its impact on the environment and culture. Opening Reception: Sunday, July 22 1-3 pm. After the reception, join us for the debut of our Dear Earth series! 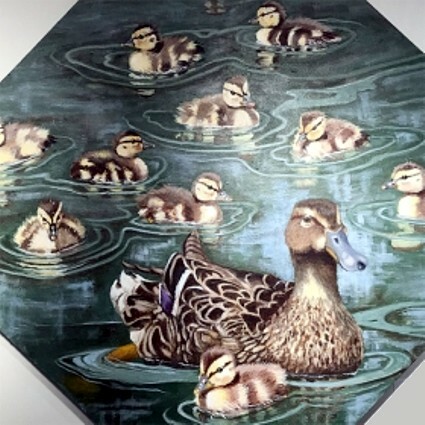 Art and nature lovers have been able to enjoy the Nature Artists’ Guild’s exhibit at Mayslake Hall of the Mayslake Peabody Estate in Oak Brook, IL since it opened on June 6, 2018. On the evening of Wednesday, June 27, 2018, from 6 to 8 pm, all are invited to attend a reception to meet and speak with some of the artists and enjoy some light refreshments. There is no charge to attend. Please click on this link for additional information about the exhibit, which will be open through Friday, July 13, 2018. More than 25 nature artists have contributed to this lovely exhibition filling two rooms of the historical estate. A sample of the artwork at the Nature Artists’ Guild 2018 Exhibit, Mayslake Peabody Estate. Colorful Iris, copyright Linn Eldred. One of many pieces by artists participating in the 2018 Nature Artists’ Guild Exhibit at the Mayslake Peabody Estate. So much art and so much nature coming up so soon! Two classes coming up very soon are being taught by some of the best artists and best instructors that The Morton Arboretum has ever offered. Suzanne Wegener will be the instructor for Drawing Nature II on four Thursday evenings beginning on May 31, 2018. Suzanne will be teaching skills that are essential to any artist who wishes to draw nature realistically. Plein Air on the Prairie, on either Monday, June 4, or Monday, June 11, 2018 is a three-hour excursion onto the prairie with a sketchbook and two experts, naturalist Cindy Crosby, and artist Karen Johnson. It’s a unique opportunity to learn about and experience the prairie from a botanical as well as an artistic point of view. Please click on the above links to learn more or to enroll. Classes are open to all, not just members of the Nature Artists’ Guild or The Morton Arboretum, but Arboretum members will receive a discount on registration fees. Page from Karen Johnson’s sketchbook. Copyright 2017, Karen Johnson. Evelyn Grala has done it again, and come up with a way to keep Nature Artists’ Guild members growing this summer. Evelyn has planned a new Summer Sketchbook Encounter, to begin on June 1 and continue until September 1, 2018. Participants will be asked to fill four pages of a sketchbook per week, using any media they would like (including crayons), and to have fun. It’s as simple as that. The improvement in drawing and composition skills will come automatically! Interested members who have not already signed up should contact Evelyn (whose contact information can be found in their Yearbook) to ensure they receive her periodic updates and encouragements. The Nature Artists’ Guild will be exhibiting at the Mayslake Peabody Estate in Oak Brook, IL from Wednesday, June 6 through Friday, July 13, 2018. The exhibit may be viewed any time during estate business hours, Monday through Friday, from 9 am until 3 pm, or Saturday between 9 am and 1 pm, but the best time to visit would be on Wednesday evening, June 27, 2018 between 6 and 8 pm. This artists’ reception is open to all, and is a great opportunity to meet and talk with the artists and enjoy light refreshments. Participating artists should check the prospectus for drop-off and pick-up dates and times. There is so much excitement and anticipation around the upcoming program featuring biologist, author and artist Julie Zickefoose on Thursday, June 7, 2018 at the Thornhill Education Center of The Morton Arboretum. All are welcome to attend this event free-of-charge. Please click on the highlighted link for more information. Page from Baby Birds, An Artist Looks into the Nest, copyright Julie Zickefoose. Used with permission. A new paint-out has been added for June, and it’s at one of the prettiest spots in the area, Meadow Lake at The Morton Arboretum. On Tuesday, June 26, at 9 am, Nature Artists’ Guild members will meet at the P-2 parking lot east of Meadow Lake. There will be water, flowers, grasses, shrubs, and trees (naturally), and even some large mysterious creatures in the area. Guild members can contact Jane Kellenberger if they would like to attend, but last-minute drop-ins by members are also welcome. Note: This post has been updated to include the new date for the rescheduled paint-out. Artist in Residence Thomas Dambo at work on one of his creations for the Troll Hunt at The Morton Arboretum. Photo credit mortonarb.org. Please click on the photo for more information about the artist. Mayslake Hall, at the Mayslake Peabody Estate, 1717 West 31st Street in Oak Brook, IL is listed on the National Register of Historic Places. The buildings and remaining 89 acres of the estate are now owned by the Forest Preserve District of DuPage County. The Mayslake Peabody Estate, amidst ongoing restoration work, hosts art classes and exhibits inspired by nature, lectures about culture, history, and architecture, as well as concerts featuring jazz and classical musicians and theatrical performances. The Nature Artists’ Guild is excited to announce that the Mayslake Peabody Estate will be sponsoring an exhibit of nature art by members of the Guild from June 6 until July 13, 2018, with a “meet the artists” reception on June 27, 2018 at 6 pm. Mayslake Peabody Estate. Photo credit Forest Preserve District of DuPage County. Members of the Nature Artists’ Guild should have received their prospectus for participating in the exhibition a few weeks ago. Prospectuses need to be completed and returned by this Saturday, May 19, 2018. Any questions can be directed to Gary Chipman or Linn Eldred, whose contact information can be found in the Nature Artists’ Guild Yearbook or on the prospectus. Additional information about artwork drop-off and pick-up dates is also included there. An added bonus for participating in this exhibit is that no extra work is required. This exhibit will feature works shown at The Morton Arboretum within the last five years, so there will be no need for last-minute tweaking, matting, or framing. All eligible members (see prospectus) are encouraged to participate in making this exhibition one to be proud of. Below are a few photos from a previous Nature Artists’ Guild paint-out at the Mayslake Peabody Estate. Please click on any of the photos for a larger image. Anyone who happens to be in the Southwest Suburbs this weekend might want to stop by the Downers Grove Public Library for an enjoyable stroll through the January exhibit of art by members of the Nature Artists’ Guild. I Like Ducks, copyright Evelyn Grala. Photo credit Downers Grove Public Library. The Downers Grove Public Library has both permanent and rotating art exhibits year-round, but the Nature Artists’ Guild exhibit ends on January 31, 2018. The exhibit and parking are free and open during library hours. This is a wonderful chance to view a variety of styles of nature art in different media by talented artists. Artists, experienced or beginning, still have time to join the Nature Artists’ Guild and be eligible to receive a prospectus for the next exhibit at The Morton Arboretum in April, 2018, which will feature more than 100 works by our members and is expected to be attended by nearly 1000 visitors over the weekend. Please click here or on the Membership Brochure tab above to read more.